Which Book and Why? is the definitive guide for teachers trying to achieve effective guided reading for children in Foundation Stage and Key Stage 1. This vital resource helps teachers to choose the right book at the right time for young readers based on focused assessments and explains how guided reading fits with current theoretical understanding of how children learn. It demonstrates how guided reading works in practice, outlines how practice may vary depending on the choice of text, teaching objectives and the needs of the child and provides guidance for school subject leaders and senior managers. Which Book and Why includes in the accompanying CD-ROM a fully searchable database to support schools and teachers in choosing the most appropriate books at the right level for each group in a class. Each section of the book offers professional development and self-study activities for teachers – including student teachers, newly qualified teachers, and staff new to guided reading; resources for literacy subject coordinators; and resources for senior management and leadership teams to support the implementation of high-quality and effective guided reading lessons. Sue Bodman and Glen Franklin are Reading Recovery national leaders at the European Centre for Reading Recovery based at the Institute of Education, University of London. I’ve found this book invaluable in my role as Literacy Leader. It provides great material and guidance to deliver INSET and to support teachers individually. 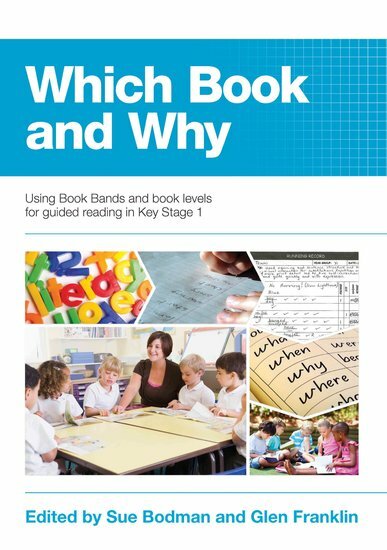 I’d thoroughly recommend it to anyone needing to understand the process of developing reading skills and in need of appropriately banded books. This is a seriously vital piece of kit for anyone teaching children how to read in English, whether early-career or very experienced. It’s a book I just keep diving into, and – as a trainer, coach and adviser – I am constantly steering subject leaders and teachers towards this as their survival kit. The suggested outlines for staff training, snippets of theory about how children learn to read, easily-digestible hints and tips and the way it has been brought right up-to-date with the most recent research findings woven in, make it unique in its field. Equally relevant to those using the English National Curriculum or those simply teaching reading the English code.